Suite Sports: Has New England Lost Its "Patriot Way?" Has New England Lost Its "Patriot Way?" With troubled cornerback Alfonzo Dennard's arrest on suspicion of DUI Thursday morning, the turd sandwich that has been New England's off-season just got mushier. Everyone seems to be pretty surprised about the Patriots' off-field exploits this offseason. How could the New England Patriots, the NFL's model organization, be involved with an alleged killer like Aaron Hernandez or a man convicted of punching a police officer last year like Dennard? All I've heard the past few days is, "this isn't the Patriot Way! How did they fall so far? Were they so desperate to win another title in Tom Brady's closing window that they souled their souls and drafted Hernadez in the 4th round (After numerous red flags) and Dennard in the 7th (While he was on trial for punching that police officer)? Well, I would like to reassure all New England fans that the Patriot Way is alive and well, but I may have to break some bad news to them: It isn't what they think it is. Somewhere along the line, there emerged this perception that the Patriot Way was Bill Belichick putting together a team of choir boys that worked hard and won the right way. Wow, I just don't even know where to begin with how ridiculous this is, but let's look at how this idea is perpetuated. Like Urban Meyer, who ran a renegade program at the University of Florida (And is friends will Belichick, incidentally), the Patriots have a great face. Tom Brady is a good-looking, likable, nice guy, just like Tebow was at Florida. Having this guy cannot be underestimated. Then you have to look at the fan base. I'm not talking about the intellectuals at Harvard, those people are too busy reading books and stuff, I'm talking about the New Englanders that you see in Dunkin' Donuts commercials. Blue collar New England has taken a great deal of pride in the Pats over the last decade plus, and they like to believe the team exemplifies the city's toughness. All towns that are "blue collar" and "tough" love to believe their teams are filled with gritty and moral people. This same phenomenon occurs with the Steelers in Pittsburgh and the Packers in Green Bay, but the Patriots have had just enough "scrappy" white guys to push them over the top. Players like Wes Welker, Tedy Bruschi, Mike Vrabel and Danny Woodhead have helped perpetuate the myth that, while New England may not be that talented, they sure do work hard and do things the right way. This is, of course, just foolish. The Patriots have been tremendously talented when they've gone to and won Super Bowls, led by arguably the greatest quarterback of all time Tom Brady. Welker is a talent, Vince Wilfork is one of the best at his position, Hernandez and Rob Gronkowski were one of the best tight end duos in NFL history, and looking back on some of those early 2000s Patriot defenses, you see some really talented players like Richard Seymour, Rodney Harrison, Ty Law and Willie McGinest to go with Bruschi and Vrabel. 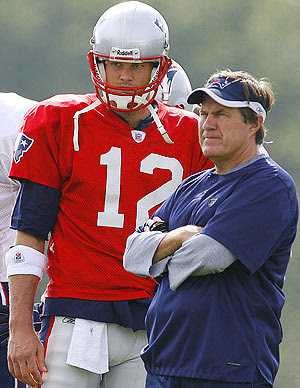 Ok, so the Patriot Way isn't about overachieving, but it's definitely about having good guys and winning the right way. The Patriot Way is just Bill Belichick being savvy and occasionally lucky. It's as much about him taking calculated risks as it is running a disciplined football team. Belichick took a calculated risk on Hernandez, a player widely considered of first round caliber, in the fourth round. And you know what, it was a pretty smart risk. Nobody could have known the guy was (allegedly) going Scarface on everybody in his spare time. Same with Dennard. The Patriots were in desperate need of secondary help, and Dennard was considered a first or second round pick before he had a poor Senior Bowl and punched that cop. Again, can you blame New England for using a throw-away 7th round pick on the guy hoping he grows up? Some people might, but if every guy that got in a fight wasn't drafted to the NFL, football would be really boring. Belichick has taken a number of other calculated risks on players in the draft and free agency. Some have worked out very well, like Corey Dillon and Randy Moss, while others have flopped like the receiver formally known as Ochocinco and Albert Haynesworth. But, in every case, it was a smart calculated risk. Even with the latter two, where the Patriots paid next-to-nothing for the aging and troubled stars. Ok, so the Patriot Way isn't about overachieving and it isn't about having good guys, but this team still wins the right way! Do you really want to go there? Whether they were mauling Peyton Manning's receivers, faking injuries to stop the clock when they were out of timeouts, or, you know, spying on opposing teams, the Patriots have never been afraid to do whatever it takes to win. Don't get me wrong, that's not a bad thing. While I believe we can and should moralize heinous things that happen off the field (And certain incredibly heinous things on it), I never moralize things that take place in the normal flow of a game. It's the same reason I don't think LeBron is a bad person for flopping. Look, if the refs allowed Willie McGinest to pretend he was injured, stop the clock to slow down the Colts' no-huddle as they drove for the win, then come back in for the final goal line stand, I'm ok with that. That's just exploiting a loophole in the rules. It's the same reason drawing fouls and penalties in sports is a skill, and why knowing a referee's tendencies can be almost as important as knowing your opponent's. You try things you think you can get away with, you take calculated risks. And that, my friends, is the Patriot Way.